Power Bar Protein Plus Energy features 20g of its exclusive TriSource Blend (Soy Protein Isolate, Calcium Caseinate and Whey Protein Isolate) per serving. These proteins have what it takes to ignite protein synthesis right after consumption, and follow through with a continuous supply of amino acids to maximize muscle recovery and regeneration. 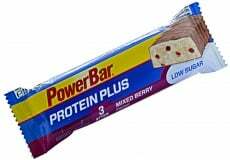 Power Bar Protein Plus Energy is also a great source of healthy carbs that will replenish your energy stores. Carbohydrates are the main energy source, so it's vital for you to feed your body with the right amounts of carbs to fill up your glycogen stores and get you ready for another day of intense training. Eating just one superb-tasting Power Bar Protein Plus Energy bar is equivalent to 2 cups of 2% milk, 1 serving of tuna and 1 serving of ground beef. That's how potent this pocket-sized energy bar is! Have a question about Barra Protein Plus Energy? What is it, what does it do, how and when to use or something else? Ask us. ALLERGEN INFORMATION: Traces: Gluten, other nuts, peanuts, soya protein. Made on equipment that also processes wheat. Consume one bar prior to strength training. WARNINGS Barra Protein Plus Energy : Store in a cool, dry place. Keep out of reach of children. As part of a varied and balanced diet and a healthy lifestyle.